So how’d we do over the holidays with our unchurched grandkids? Should I answer that question before or after Mary shot the rogue sheep that kidnapped the baby Jesus? 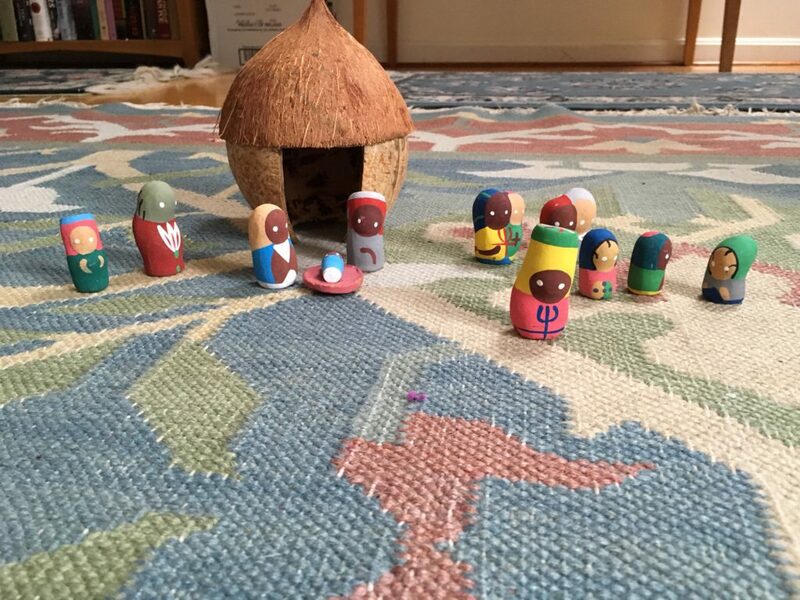 We have three crèche sets, one from Haiti with small clay figures that fit inside a coconut. The Friday after Christmas, four year-old Anastasia brought her new fire truck and five Calico Critters with her, but instead of playing with them, she asked if I could put the coconut crèche on the floor. 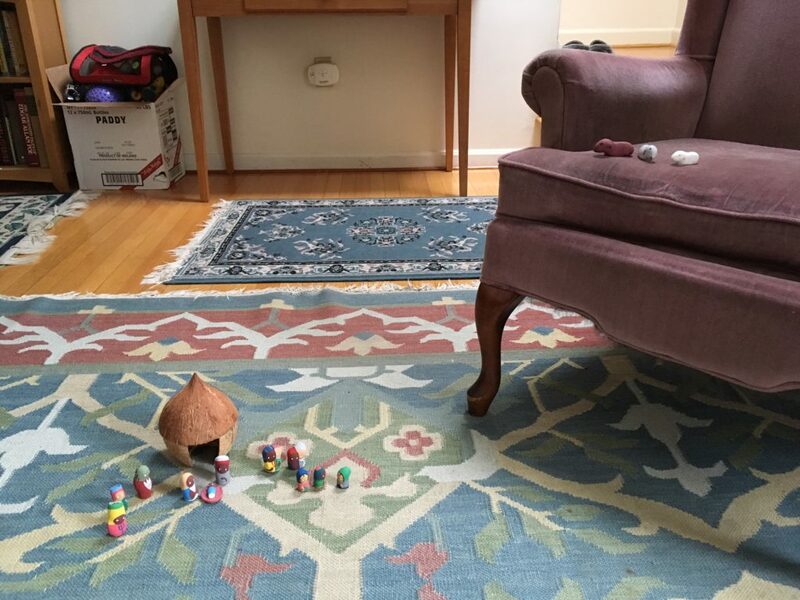 First we set up the coconut as the barn, then she brought Mary and Joseph and the baby, then the shepherds and their sheep and their families, then the kings. I was delighted that she actually remembered the order of arrival! She even used one of our window candles as the star. Then the sheep started running away and getting lost, so she recruited one of the kings to be an extra shepherd. The sheep especially liked climbing the chair to graze in the high pasture of the chair’s cushion – except they didn’t know how to get down, so she brought in her fire truck to rescue them with its extending ladder and bucket. We built an enclosure for the sheep with blocks, but they kept escaping over the walls. When we finally got the sheep pen tall enough to keep them in, the story seemed to lag a little, so she got a beat-up stuffed sheep that was mine when I was a little girl, and this much bigger rogue sheep came and kidnapped all the shepherds’ children. Mary took off in the fire truck and rescued them. Then the rogue sheep came back and kidnapped the baby Jesus. This time when Mary found the sheep, she pulled out a gun and shot it. 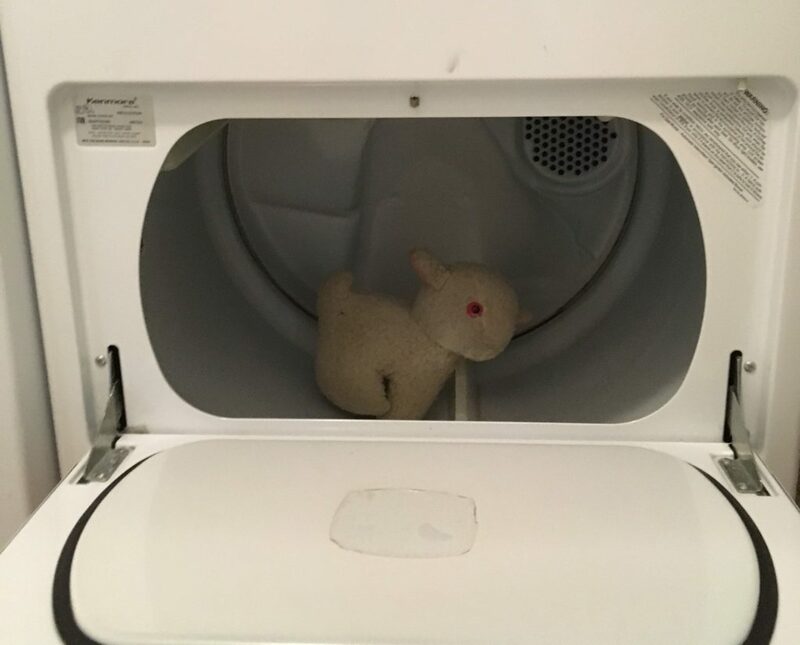 She took Jesus back to the coconut, and then she put the sheep in our dryer, which she said was an oven, to cook for dinner. So what’s my overall takeaway from this Christmas season with our granddaughters, who come to us one day a week each? Their parents had given permission for us to invite the girls into the story of Jesus’ birth, but since Beatrix is only 16 months, about as much as we managed was to let her hold the sturdy olivewood figures from the crèche we got in Jerusalem, and to look at pictures in Mary’s Little Donkey and Star of Wonder along with The Christmas Cat and The Night Before Christmas. 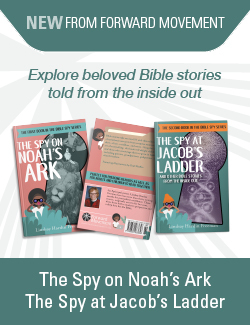 With four-year-old Anastasia, we actually read all the books, and we had some pretty exotic adventures with the olivewood figures, building bridges over furniture for the kings to travel. Early Epiphany morning before she arrived, I hid all the kings from all three crèches so she could find them and take them to their appropriate locations, which she did. It all sounds pretty good. But back on the 6th Day of Christmas, Mary shot the sheep. The sudden violence took me by surprise. Well, I thought, at least she knows the basic story. And she knows lost sheep should be found. And she knows children should be protected, and that a mother’s love is fierce. And – I convinced myself – she understands hospitality, what with Mary getting up so soon after giving birth in order to fix dinner for everyone – on top of having been the one to track down and kill dinner. I can put a positive spin on the whole thing, but I worry…. I think it’s hard to know what effect any of our Christmas and Epiphany play will ultimately have on these little girls, who are growing up in a secular culture that is rife with violence. What I do know, though, is that when we sat down to lunch on Epiphany, Anastasia voluntarily reached out her hands to Grandpa and me, and for the first time on her own began our before-meal prayer: “Glory be to God our Creator, to Jesus the Christ, and to the Holy Spirit who dwells in our midst, now and forever. Amen.” Then she squeezed our hands and ate her grilled cheese sandwich. Did you share part of Christmastide with unchurched grandkids? How did it go? This story disturbs me. What disturbs me most is the fact that you allow a toy gun in your house. Guns are not toys! My sons, now in their mid and late 30’s, were never allowed to have toy guns nor were our friends son’s families. There is already too much violence in the world, giving a toy gun in my mind only plants the idea that violence is acceptable. While you, as a Grandparent, cannot control what toys your Grandchildren have at home my suggestion is to make a firm rule that NO guns are never allowed in your home. We have no guns. Anastasia simply told me what Mary had done. It was the imagined gun violence that surprised me. Kids will just do that. Our grandson doesn’t have guns and he makes them out of everything. I’ve known kids in gun free houses to chew their toast in the shape of a gun. Honestly, I wouldn’t worry too much, it sounds like she has a great imagination and a willingness to have the story go in many directions. Just keep showing her the story and eventually the excess will wander off. I appreciated this story very much. We have this with grandchildren too. They know and like to say grace before meals with us now too. I guess we are just there with them and add to their lives and pray for them. Hopefully we will be a good influence and they will remember what it was like at Grandma and Papa’s house. It is easier with my grandson but his step sister has a mom that refuses to let her go to church. Thanks for your honest post. I was raised without religion and watching my grandparents practice their faith definitely made a difference for me. I am sure you are making a difference with your grandkids as well. Totally not on subject – I have that same nativity scene and love it. Mine was purchased at St. Armand’s Circle near Sarasota Fl. Where do you get yours? Just curious. Thanks. My other daughter-in-law got it for me when she was working in Haiti; I love it, too! I thank you for your story. It is a real reflection of what kids see and reflect today. I believe just as your granddaughter learned grace, she can know violence is not the answer. Your examples for them are good. I can’t wait to be sharing with my own grandchildren!